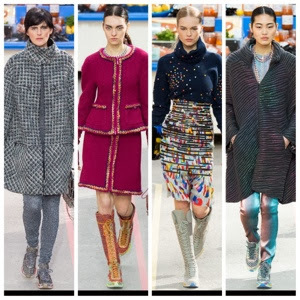 Stylish shoppers walked down the custom Chanel supermarket catwalk dressed in candy coloured tweed coats and bubblegum pink jumpers and leggings, all paired with the fanciest trainers you will ever lay your eyes on. The models sported corset shapes similar to the ones seen in the Chanel Couture Spring show, but they were shown in much easier way to wear for everyday life. Metallic jeans were worn over quilted outerwear embellished with zip details. Of course Karl's stunning muse Cara Delevigne opened the show and closed it holding Lagerfeld's hands as they pranced down the runway. Don't you just wish you were them! I felt overwhelmed by the Alexander McQueen show, not really in a good way. I love the fantasy of the collection, especially styling of the intricately braided hair and the pale faery like makeup. But I was quite disappointed by the clothes. I felt like the appliqueing was overworked looked quite heavy. My favourite piece was probably the black ruffled dress but it reminded me a lot of a toned down version of the pink dress that Burton designed for the Fall 2012 show. I don't know I guess I just have really high expectations for Alexander McQueen and this season and last season were really disappointing shows for me. Lots of people do love what Sarah Burton is doing at McQueen, this is just my opinion. What do you think of the Paris Fashion Week Shows so far?